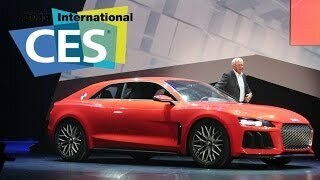 Audi is presenting a fascinating technology concept car, the Sport quattro laserlight concept, at the Consumer Electronics Show (CES) in Las Vegas. 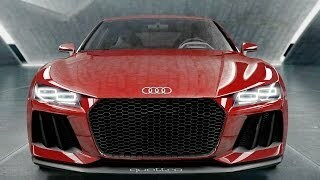 The car is virtually identical to the Sport Quattro concept that debuted at the 2013 Frankfurt Motor Show. 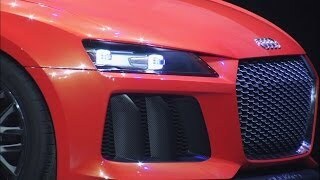 The car has matrix LED headlights with laser light technology. Two low-profile trapezoidal elements are visible within the headlights – the outer one generates the low beam light using matrix LEDs and an aperture mask, while the inner element produces laser light for high-beam functionality. Illuminating the road for a distance of nearly 500 meters (1,640 ft), the laser high-beam light has approximately twice the lighting range and three times the luminosity of LED high beam lights. 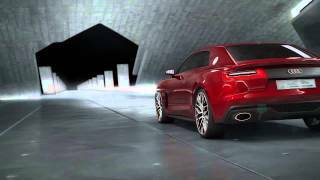 The concept has Plasma Red exterior and a three-dimensional display that is powered by a cutting-edge Tegra 30 processor from Nvidia. 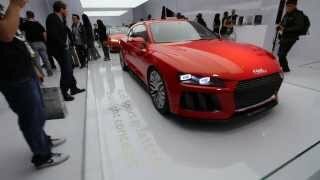 The Sport Quattro laserlight concept has a plug-in hybrid powertrain that consists of a twin-turbo 4.0-litre V8 engine and a disc-shaped electric motor producing a combined maximum output of 700 HP (515 kW) and 800 Nm (590 lb-ft) of torque. The car can accelerate from 0-100 km/h (62.14 mph) in 3.7 seconds and hit a top speed of 305 km/h (189.52 mph). The show car's combined fuel consumption is just 2.5 liters of fuel per 100 km (94.09 US mpg) – which equates to CO2 emissions of 59 g/km (94.95 g/mile). The car can travel up to 50 km (31.07 miles) on electricity alone.